Irrigation has helped farmers feed a population that has now reached 7 billion people. But in many places farmers have overused underground aquifers that have taken thousands of years to form, drawing down the fossil water much faster than it can be replaced. The Ogallala aquifer in the American high plains, along with similar aquifers in Mexico, Eastern Europe, Egypt, Arabia, Iran, India and China, represent the crisis zones for humanity’s groundwater footprint, according to a new analysis published in Nature on August 9. (Scientific American is part of Nature Publishing Group.) 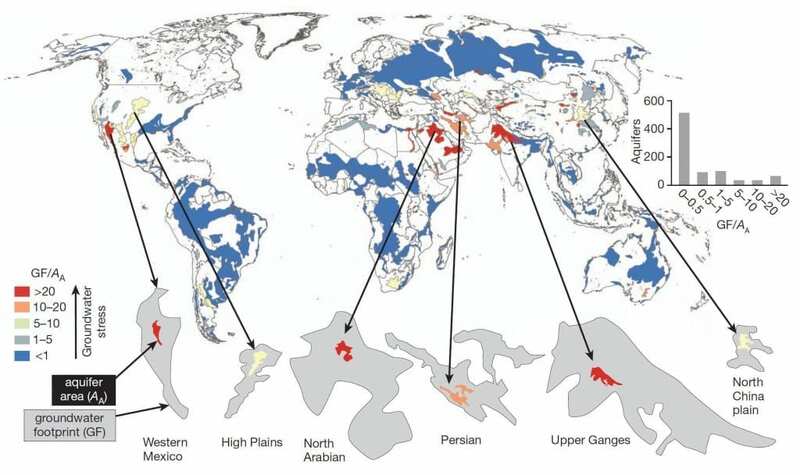 Here’s what the world’s groundwater footprint looks like (see map above). As shown, the “footprint” (gray) represents how much water people are drawing from the aquifer, compared with how much the aquifer actually holds (in red, orange or yellow, depending on how bad the water imbalance is). The imbalance exists because these aquifers support agricultural zones much larger than their physical extent. These areas also happen to be some of the most vitally important agricultural regions of the world. In fact, 1.7 billion people in these regions rely on these waters directly—each and every one of them facing a looming water crisis. And in times when the rains fail—such as is occurring now throughout the Ogallala aquifer region in the U.S.—such fossil water is the only hope to keep crops from failing too. The problem with drawing too much water from an aquifer, which has been stored in these geologic formations for thousands of years, is that it can’t easily be restored once pumped dry. That’s the crisis facing farmers who rely on the Ogallala Aquifer, which once contained enough water to cover the entire continental U.S. roughly half-a-meter deep. Once pumped dry, the Ogallala would take at least 6,000 years to refill.